AMD gamers rejoice! Real-time ray tracing for Radeon could be in the cards after all. "This demo runs on most mainstream, contemporary AMD and Nvidia GPUs," reads the introductory text in a new demo video released by Crytek. What follows is a reel of Blade Runner-inspired footage, a science fiction infusion of neon lights bouncing off the most reflective surfaces imaginable: condensating windows, shattered mirrors, empty bullet shells rusting in shallow puddles of rain. A glistening metal drone whisps through the drizzling night sky. The demonstration, titled "Neon Noir," is rendered entirely in real-time and is designed to flaunt the effects of ray tracing across multiple video cards and APIs. In the video, Crytek says, all two minutes and three seconds shown of the demo are running on an AMD Radeon RX Vega 56 graphics card. And while we consider that GPU one of the best graphics cards you can buy right now, it's well established that real-time ray tracing is a feat only Nvidia's RTX cards can accomplish at reasonable framerates. Or so we thought. 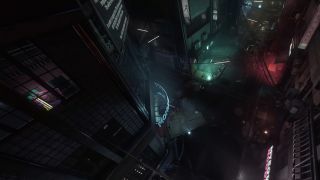 Neon Noir was, according to its creator, developed using a modified version of CryEngine 5.5. Leveraging an existing facet of the engine called "Total Illumination," it works by removing some of the notorious pain points of the development process, such as pre-baked cube maps and local screen space reflections, particularly when creating "smooth surfaces" (windows, mirrors, metal drones, etc.). In other words, its aim is to streamline the implementation of ray tracing for game developers. Until now, ray tracing—at least in the context of gaming—has hinged on the RT cores found exclusively in the Green Team's pricey, Turing architecture-based GeForce 20 series cards released last September. But now, thanks to a custom-fitted CryEngine 5, it seems it is possible to bring similar functionality over to AMD and pre-Turing Nvidia systems alike. That is, so long as they boast compatibility with DirectX 12 and Vulkan, the two APIs supported by Neon Noir. To be clear, in theory any DX12-enabled GPU that has drivers with DXR support should be able to run DXR games with ray tracing enabled (currently Battlefield 5, Metro Exodus, as well as 3DMark Port Royal). The problem: neither AMD nor Nvidia have released such drivers so far, with the RTX series being the only option. Crytek may be leveraging unreleased drivers, or it may have taken a different approach to implementing ray tracing. Either way, it works. Though older components may struggle to keep up with a demo like this due to their weaker DX12 and Vulkan rapport, the demo makes a compelling case for buying an AMD card in 2019. In our review of the AMD Radeon VII, the Red Team's first graphics card based on the 7nm fabrication process, we lamented its lack of features, specifically pointing out the glaring absence of ray tracing. However, as Crytek has now proven, that doesn't necessarily have to be the case. In glorious 4K UHD, the CryEngine trailblazer, famed agitator of gaming PCs circa 2007, Crytek is exhibiting a ray tracing solution it deems "both API and hardware agnostic." No longer tying you to the powerful but exorbitant GeForce RTX-series cards, it will be interesting to see how Nvidia responds to the demo. Experimental as it is, there is a deep hunger for the benefits ray tracing yields, albeit minus the imposing barrier of entry. Even if it doesn't look quite as splashy as Nvidia's primo take on the same tech, imitation ray tracing is still a marked improvement on the AMD and Nvidia Pascal ray tracing options of the present. Because there are none. And hanging onto your old graphics card to catch a glimpse of lifelike lighting and shadows is a much easier pill to swallow than shelling out over $300 for a marginally better experience on a Turing-based Nvidia GPU. That does bring up the question of performance, however. While Neon Noir can run without an RTX card, if it's using DXR or Vulkan extensions for ray tracing that are accelerated on Nvidia's RTX cards, it should run faster on such hardware. It's also unclear how things will scale when moving from a demo to an actual game. Getting a small environment with ray tracing effects to run well isn't the same as doing ray tracing in a larger open environment. It's too early to tell if Crytek's Neon Noir demo really is indicative of a ubiquitous future for ray tracing. As it stands right now, no games support real-time ray tracing without an RTX card, but that may change. This new tailor-made rendition of Total Illumination will make its way to CryEngine later this year. Soon enough, we'll see whether or not developers are as interested in ray tracing on AMD and legacy Nvidia graphics cards as I am. Better yet, perhaps we'll even see a few clones of this same feature running in more customary game engines like Unreal and Unity. Whatever the case, we're sure to learn more about Neon Noir and various other CryEngine trappings throughout our week at GDC.